Former Oklahoma Sooner and Tampa Bay Buccaneers defensive tackle Gerald McCoy had to wear Texas Longhorns gear after losing a bet. Poor former Sooner Gerald McCoy. The Tampa Bay Buccaneers defensive tackle felt so confident that his alma mater, ranked No. 10 in the country at the time, would have it easy against the Texas Longhorns. So he made a little wager with former Longhorns players Henry Melton and Roy Miller. So now everybody knows who won that bet, and it wasn't McCoy, who, judging by the photos, doesn't look all that happy about it. 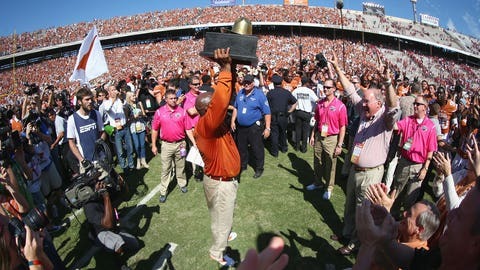 Texas' 24-17 victory over Oklahoma in the Oct. 10 game at the Cotton Bowl meant McCoy had to go head-to-toe in burnt-orange Longhorns gear, a state crime in most of Oklahoma. McCoy's face during the television interview tells the entirety of his despair.